Spoonie Tip For The Waiting Room The Nook eRreader Is A Must Have! If you’re like me, you spend a lot of time waiting. I’m waiting at appointments, the pharmacy, for rides, and so on. This is where my Nook eReader comes in handy. In fact, the decision to purchase one came after spending 5 hours in the urgent care waiting room. I’d grabbed the paperback I was reading, but that didn’t last long. So, off I went to my local Barnes and Noble and picked up a Nook. When I purchased it, there was only the original model in two versions, a Wi-Fi only, and a Wi-Fi with 3G. I went with Wi-Fi option as it was explained to me that if you have access to a wireless connection, 3G isn’t necessary. Since then, they have released the Nook Color which comes in just a Wi-Fi model. No glare: It’s easy on the eyes for reading. Wide variety of content: Not every book is available as an Ebook, but Barnes and Noble has thousands of Ebooks, including textbooks and free Ebooks. A notepad program for notes, lists, etc. Overall, I give this product 4 spoons. It has flaws, but is one of the most useful things that I own. I have recently purchased the Kobo e-reader and am in love already. With the triple-whammy of MS, fibro and early arthritis (with a topping of what I suspect will be carpal tunnel when I get to see my doctor!) it was a combination of the waiting room/heavy bag/too-sore hands that did it. I read the first of Michael Palin’s diaries a few months back and while I loved the book, I could feel it causing me pain. Australia has limited options so far, but I am looking forward to getting magazines subscriptions in the future. I also like that I can carry and read PDFs, which means I can convert documents and carry them with me easily and without losing them! I love my Nook! The size is so convenient, it fits in my purse and doesn’t take up a lot of room. I take it everywhere. At the dr office, traveling, even to work so that I can read on my lunch break. If you have a smart phone, you can download the nook app and read on the go. 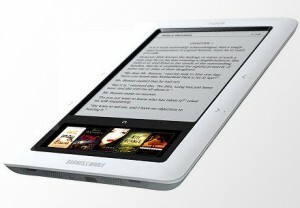 Both the nook and the app on the phone allow you to change the size of the text to ease in reading. I would highly recommend it. For those watching their wallet, many mobile phones have a kindle app that allows downloading of often FREE books from the website. There are literally thousands of free books available; I read them on my Evo. Don’t have to pay for or carry a separate device. I thought the screen would be unpleasantly small for reading, but I haven’t found it detrimental at all. I’m so happy with my nook. The arthritis in my hands was making it difficult for me to hold many of my favourite books. I took have the wi-fi only “Classic Nook”, which I bought because of weight. It has opened a new world to me in which I can read again without pain. The text is easy to read and pages easy to turn and fast. JMHO, but I think this is a great device for those who have difficulties with holding books, and some eyesight issues (you can adjust the size of the print on the page). I can only hope that they will get even lighter and easier to hold in the future. I plan on getting one myself in the very near future. One thing people should investigate is which version of eBook reader is compatible with the eBooks available at the local library. I know that Kindle idoes not work at my library, though Kobo, Barnes & Noble, Literati, and Sony are. You can also get an Adobe Digital download so that you can read eBooks on your laptop. When the Kindle first came out I almost cried because I am a published author and was afraid that I wouldn’t sell any books. After a few panic attacks, my publisher told me that my books are available on all of these kind of reader formats through them and amazon. Well, I still wasn’t convince that I would ever want to own one until I started looking into purchasing one for a contest I am doing. The more I read about these, the more I decided that I want one. I ordered a Kindle last night to give away, but I am sorely afraid I will have to have one for myself soon. I like to bring my own reading materials to dr offices because the people who read the magazines in there are sick. Is it silly to think that I might catch something if I handle them? The fibro is hard enough without something else added to it. I bought the cover for mine and it’s great, with arthritic hands it makes the Kindle so much easier to hold and I don’t accidently press a button on the side. There is a way to convert e library books to Kindle. Go to the amazon discussion site for Kindle, there are answers there. You can also now share your ebook with another person for 14 days for free. I agree that the nook is a great option, but I would recommend an iPad instead. Keep your notes, symptom diary, books, music, games, magazines and well almost all the items in christine’s waiting bag all in one item. Then if you want books there are several apps (iBooks, kindle, kobo) that can each be customized by font size, font, brightness. Basically an iPad would give you all the above features, plus all of the could be improved on points! I received an Amazon Kindle 3rd Generation for the holidays this year and I love it! It was difficult to choose between the Nook and the Kindle, however after I tried both out at Best Buy, I was sold on the Kindle. IMO, the Kindle is much more responsive and easier to use. But again – your choice as both are pretty affordable. The biggest thing I think the Nook has over the Kindle is that the Ebook format allows you to borrow Ebooks from the library if you have that option at your public library. The Ebook format is not compatible with the Kindle, unless you are able to convert it somehow (and that takes more time than it’s worth).